In The Martian, Matt Damon played an astronaut that becomes stranded on Mars. The Space Between Us is essentially the reverse of that. The film centers on a young man who’s born on Mars and travels to Earth for the first time. This is a terrific premise full of potential. Thanks to a talented cast and Peter Chelsom’s capable direction, there are parts of The Space Between Us that work well. Other parts, however, feel rushed, half-baked, and overly romanticized. Of course this really isn’t surprising, considering that the same guy who brought us Collateral Beauty also wrote this movie. Thanks to a talented cast and Peter Chelsom’s capable direction, there are parts of The Space Between Us that work well. Other parts, however, feel rushed, half-baked, and overly romanticized. The story opens in the near future as several astronauts arrive on Mars. One of the astronauts turns out to be pregnant and dies during childbirth. The baby is named Gardner Elliot, who grows up to be played by Asa Butterfield. Since he was born on Mars, Gardner’s body can’t function on Earth. So he spends sixteen years on the Red Planet under the wing of an astronaut named Kendra (Carla Gugino). The people behind this space endeavor, which includes Gary Oldman’s Nathaniel Shepherd, decide to hide Gardner’s existence from the public. Gardner’s only contact on our world is a teenage girl named Tulsa (Britt Robertson), who he communicates with online. Through surgery and physical training, it appears that Gardner might be able to survive on Earth. Upon arriving, however, it quickly becomes clear that he won’t last long. Knowing that his time is limited, Gardner makes a break for it and tracks down Tulsa. Together, they take a road trip in search of Gardner’s father. All the while, Kendra and Nathaniel try to find Gardner before it’s too late. The best scenes in The Space Between Us are at the beginning. You truly feel for the isolated Gardner as he longs to visit Earth and make a connection with someone his age. Once he actually gets to Earth, though, the plot becomes messy. It’s hard to believe that NASA would lose track of Gardner so easily. What’s just as inexplicable is how two teenagers continually give the authorities the slip. On top of that, there’s a predictable twist in the third act that’s particularly forced, calling one character’s motivations into question. In the end, nothing really adds up. In the end, nothing really adds up. Despite all the plot holes, our two leads at least manage to make The Space Between Us watchable. Butterfield, who previously played a socially awkward teen in A Brilliant Young Mind, molds Gardner into a likable and identifiable character. Robertson is also a delight as a rebellious foster child looking to get away. They have a natural chemistry together, even if some of fish out of water bits can grow old. With these two behind the wheel, I was almost willing to go along for the ride, but the problems here are just too big to ignore. 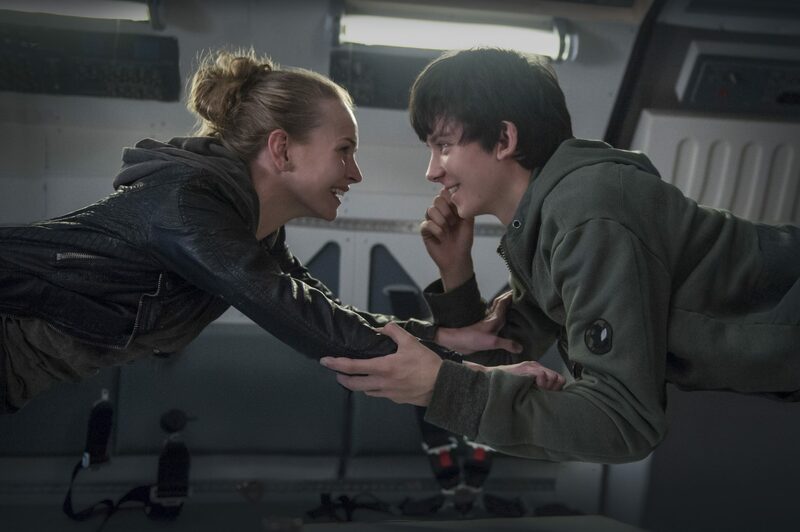 In the hands of another screenwriter, The Space Between Us could’ve been one of the great modern sci-fi pictures. While the film produces a charming romance, some memorable visuals, and several intriguing ideas, it ultimately feels like a missed opportunity. If you’re at all interested in seeing a young adult version of The Martian, it might be up your alley. If you were expecting more from this premise, though, you’ll likely walk out of the theater wondering what could’ve been. This entry was posted in Reviews and tagged Adventure, Drama, Romance on February 3, 2017 by Nick Spake.